I thought about that fistfight a lot during my last eight-day silent retreat. I've felt the desire to punch someone in the face a few times since my high school days, but it was only during this last retreat that I felt the need to fight somebody. Not just anybody; I wanted to fight Jesus. Maybe not a full-blown fight, but at least the chance to lay one on him. You are probably shocked by the chutzpah of my comment, but hear me out before you judge me. Sometimes, Jesus frustrates me. He upsets me once in a while, but this is the first time I’ve wanted to punch him. I know this says more about me than it says about the Good Shepherd, but the annoyance is real. Jesus has a way of saying and asking for things that can make me a bit antsy or frantic. He says these things when I am edging closer to my limits. The truth set us free. But before it sets me free, it irks me. Jesus ticks me off at times – much like Mom annoyed me with her comments when I was a teenager. She was usually spot on, but my pride could not handle it. I’ve grown a bit since then, but not as much as I’d like to. During my retreat, I found myself vulnerable and a bit lost. Jesus’ companionship reaffirmed me, but it also challenged me. His love soothed me, but it also confronted me. Without saying it out loud, I knew what Jesus was asking of me. It scared the bejesus out of me. The prospect of Jesus’ invitation threw me into a panic. It was a very visceral reaction. I could not surrender to his love. I wanted to stand my ground. Thoughts of Jacob wrestling with God crossed my mind. I clenched my spiritual fist and I readied to battle the Son of God. This would not be a David-and-Goliath-like battle. 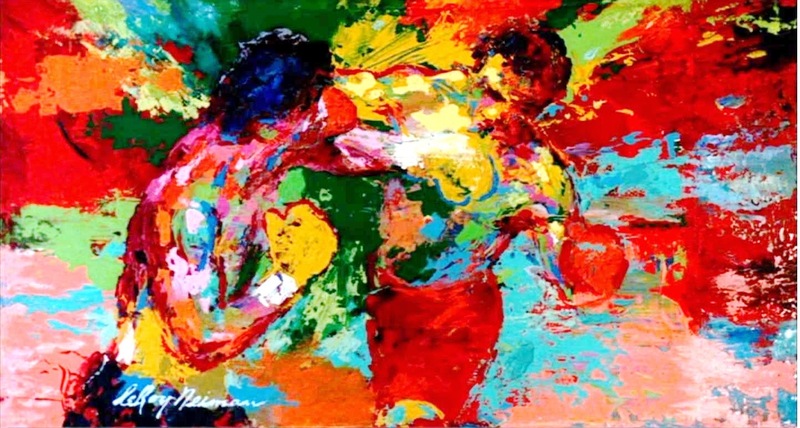 I pictured it more like the friendly fight between Rocky Balboa and Apollo Creed at the end of Rocky III – much like Apollo, I wanted to make a point. I didn’t need a barn-burner; I only wanted a few rounds. Jesus and I would climb into the ring through the ropes. There wouldn’t be any trash talk with Jesus, so I’d just settle for the boxing handshake. I’d put my mouth guard on, but Jesus would not. 'Wow, Jesus, you are tough.’ He’d smile. 'Are you ready?’ I would ask. 'Absolutely,' he would say – I don’t imagine Jesus sounds anything like Apollo Creed. Eye of the Tiger would be playing, but there’d be no punches. Jesus is a nonviolence kind of guy. He’d dance around me, and wear me out. I’d try to land a jab or a hook, but Jesus would be too fast for me. In terms of his style, I imagine Jesus is less like Mike Tyson and more like Muhammad Ali. I can’t picture Jesus as a biter. Like Cassius Clay, he probably floats like a butterfly and stings like a bee. Jesus has both rhythm and power. His rhythm is measured in love and his power has nothing to do with punches. Ours would be a spiritual boxing match – just another way to let the Carpenter’s Son love me. He would agree to a match in order to wear out my pride and fears. He does not fight me to force me into his ways. He wrestles with me to undo my worries and tribulations. Instead of a punch to the breadbasket, Jesus offers me freedom. His mercy overcomes the heavy earthliness and selfishness that resist his pleading love. He delights as he utters: ‘Abide in me’. Love prevails when he hears me say: ‘When I am weak, then I am strong’. His victory is my yielding, and, in the yielding, I grow strong. Jesus is the holy pugilist. He does not shy from a good dance around the ring. He confronts us because he loves us. That makes us uneasy. By loving us, God stirs and brings to the surface the areas of our lives we would rather ignore – areas that, if we had our way, we could live just fine without ever having to change. All of us have those areas. We all react differently to the confrontation, but all of us have to deal with them. God desires to remove those things that hinder us from moving forward. He wants to teach how to love more deeply. His merciful strivings wear out our egos and our inability to trust. His victory is also our victory. If we yield, there will be peace and strength in our hearts. As we surrender to Love, we become better lovers. We are transformed as we pray on the ring where our ‘foe’ becomes our friend. God does not want to bloody our noses or to lame us with his touch – ask Jacob. He wants to strive with us towards greater freedom. So next time you are confronted and the Word of God disturbs your security, don’t run, don’t hide, and don’t ignore it. Prepare to dance around the ring, but know that the thrill of the fight is no match for the joy of surrendering to our loving rival. I was a bit bothered by your title, but as I read your entry I could totally relate. Would you say your reaction was a desolation? A desolation that ended up turning into a hard consolation.